Because I know the entire week we’re away will be an exercise in indulgence, I’ve been trying really hard not to live on cookies this month. It’s easier said than done with three or four different varieties in the kitchen at all times lately… I had actually been doing pretty well until these chocolate butter cookies emerged from the oven. If eating cookies for breakfast is wrong, well, I’ve had one or two bad mornings! These cookies are tender with so much rich, chocolate flavor. Cocoa powder is bloomed in melted butter to form a paste that becomes the secret to the intense chocolate goodness in the cookies and the addition of a bit of instant espresso powder amps the chocolate factor up even more. These cookies are fantastic on their own so if caramel isn’t your thing you can totally skip it. Maybe just a drizzle of white chocolate to dress things up instead? 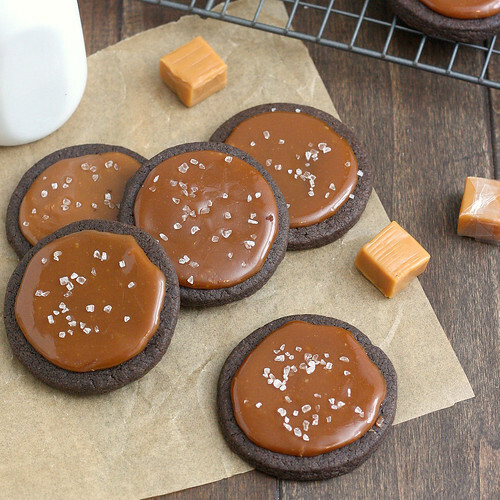 But if you are a caramel fan, the combination of the rich chocolate cookies with the sweet caramel glaze and sprinkle of sea salt on top is absolutely heavenly. Add 4 tablespoons of the butter to a small saucepan set over medium heat. Allow to melt, then add the cocoa powder and espresso powder. Stir to combine – the mixture should form a smooth paste. Remove from the heat and allow to cool for 15-20 minutes. In the bowl of a stand mixer fitted with the paddle attachment, beat the remaining 2 sticks of butter with the sugar, salt and the cooled cocoa mixture on medium speed until fluffy, about 1-2 minutes, stopping to scrape down the sides of the bowl once or twice. Mix in the egg yolks and vanilla until incorporated. With the mixer on low, add the flour in 3 additions, beating just until the dough comes together. Turn the dough out onto your work surface and divide into 3 equal pieces. Shape each piece into a disk, wrap in plastic wrap and chill in the refrigerator for at least 45 minutes to 1 hour (you can chill it longer, but you’ll want to take it out of the fridge and let it sit at room temperature for 10 or 15 minutes before you try to roll it). Preheat oven to 375 F with racks in the upper and lower thirds of the oven. Line two baking sheets with parchment. Working with one disk at a time, roll the dough to a thickness of about 3/16-inch (I like to roll this dough on a sheet of parchment paper, you shouldn’t need to add much flour to prevent the dough from sticking). Use a 2 1/2-inch cookie cutter to cut rounds from the dough and place on the prepared baking sheets, leaving about 1 inch between the cookies. Re-roll the scraps once and cut as many cookies as you can (if the dough gets too soft, just pop it back in the refrigerator for a few minutes before you proceed). Bake the cookies for about 10 minutes (rotating the baking sheets halfway through), or until the center are just barely set – they should offer just a tiny bit of resistance when pressed. Transfer the baking sheets to wire racks and cool the cookies for about 5 minutes then remove them to the racks to cool completely. Repeat with the remaining disks of dough. Store in an airtight container between layers of wax paper or parchment (even when it’s set up completely, the caramel glaze will stick to the underside of cookies stacked on top of it). 28 Responses to "Salty Chocolate Caramel Butter Cookies"
These cookies look so decadent and wonderful! They could even be little Mickey ears if you position them the right way. 😉 Have so much fun in Disney!! Oh man Tracey- you are truly a woman of my own heart- these cookies are my dream! 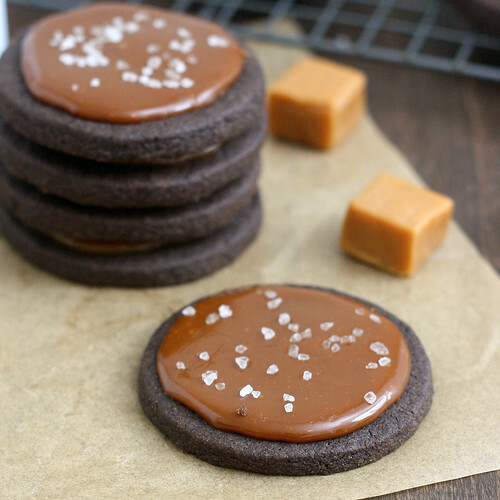 I am so obsessed with anything chocolate/salted caramel and I love how perfect these look! About Disney- at Epcot there is a ride called “Soarin'” I think? Or soemething like that…It’s a virtual reality type ride where you get to ride over California. Hard to explain- but it’s amazing!!! Have fun lady! Cooks Illustrated recipes are always a win and good to know about that bloomed cocoa butter paste. Yum! I have a couple caramel recipes coming next week – and now I want to make these! Enjoy WDW! Try the school bread from the Norway pavilion in Epcot, and as for attractions, the TTA Peoplemover and the riverboat in Magic Kingdom. Epcot has beautiful Christmas decorations, and the Osborne Lights in Hollywood Studios are unbelievable. You’re going at an exciting time, with new Fantasyland just opening and Test Track re-opening! These are so gorgeous and right up my alley! Yum! Disney at Christmas is the absolute best! Our favorite restaurant is Todd English’s Blue Zoo at the Dolphin and Swann hotels. A-mazing!!! Then there’s always eating your way down Main Street USA! These cookies are fantastic! Can’t go wrong with chocolate, caramel, and sea salt! Oh wow. These are beautiful. I love the caramel/chocolate combo and I like how the caramel sets up. These are stunning, Tracey. I want to look at them all day long! Looks yummy!! !Chocolate, caramel & a touch of sea salt is the perfect combination. These are gorgeous! And I’m totally jealous of your vacation! We’re trying to wait until all the boys are old enough to remember it before we make a Disney trip. ah, I see you weren’t able to resist the ATK cookies magazine. I’m still debating whether or not to buy it. =) These look like a great cookie–I love the salt on top. Completely gorgeous! I want to live on these for December! Disney is amazing over the holidays, have a wonderful time! This may be a dumb question.. but is it possible to eliminate or substitute out the espresso? Husband is super allergic, can’t have it in the house. 🙁 so jealous of your trip! Beautiful cookies! Love the salt on the chocolate. These look fantastic! I’m a caramel fiend, so I definitley won’t be leaving that part out. And thank goodness there is someone else like me out there who might sneak a cookie for breakfast or something else crazy like that. 🙂 Have fun at Disney World – Super exciting!! I was just wondering if it is possible to just melt caramels without the cream for the topping? my kind of cookie! looks great. I am making these tomorrow can I use natural cocoa instead? @Anonymous – Yep, the recipe will still work. Enjoy! These are wonderful!!! I made them (along with 3 other kinds of cookies) for neighbors. I posted the photo on FB and had MANY requests for the recipe So I linked the site! I love so many of your dishes! Thanks for all the great recipes! Never seen instant espresso powder but I have looked. I don’t want to leave it out but are there any thoughts/substitutions? @Anonymous – You can definitely make the cookies without the instant espresso. It really just intensifies the chocolate flavor. You could probably substitute instant coffee if you want, but I’m not sure it’s going to have the same impact since it’s not as rich. Maybe go for a dark roast? Hi Tracey – This recipe looks amazing, but I detest using cookie cutters. Do you think rolling the dough into log(s) with a 2 1/2 inch diameter before placing the dough in the fridge would work?